Hometown: I was born in Oxford, but grew up mostly in Sussex. What work experience had you gained before coming here? I had done a few placements at supported accommodation and education facilities, but the bulk of my experience comes from working with an assertive outreach team for people with schizophrenia who needed twice daily input. Why did you choose Warwick? Warwick's medicine course is purely postgraduate, meaning I would be learning with people who were at a similar stage of life to me - after a few years out in the world and working, I'm not sure how I would've handled fresh-faced 18 year olds! How are you finding the MB ChB so far? First year was harder than I thought it would be, and was at times more than I could handle. I got through it, though, and being in hospital full-time in second year made me certain that medicine was definitely for me. Clinical placements: exciting, terrifying, rewarding. What do you most enjoy about the course? The amount of time we spend in hospital, from the very first month of the course, is great. It's the best way to learn. What surprised me is how much of the course is you choosing what to learn, in a good way. Everyone learns differently, everyone learns different things, so everyone brings something different to the table in group work. Have you been involved in any extracurricular activities during your time here? I'm on OSCE Peer Support committee, which helps the lower years refine their clinical skills and get used to practical exams. I also took part in WMS Revue this year, organising, writing, directing, acting and singing - more stressful than medicine, if I'm honest, but so much fun. Do you have any idea at this stage about which specialty you’d like to pursue? I came into medical school wanting to be a surgeon. 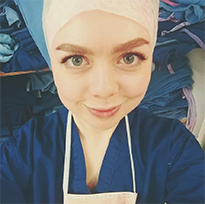 Having now spent time in theatre, I am desperate to be a surgeon. Deciding on a specialty may prove more tricky. Do you have any advice for people applying to the MB ChB at Warwick? My advice is not to worry that you may not have this or that attribute other people applying have. I don't have a biomedicine degree or a 'traditional' science background, and I've never worked as a carer or a healthcare assistant. It's not about going in ready to be a doctor, it's about going in ready to leave the course as a doctor, and to get as much as you possibly can out of the four years along the way.